The entry lists for Les Petits As are out, with the Fruhvirtova sisters among the entries although this is prior to the withdrawal deadline, so Linda, the older of the two, may still decide to instead play the ITF J1 in the Czech Republic, which is the week before. Brenda, just 11, will be competitive in spite of her age, as her Eddie Herr 14s title earlier this month demonstrated. As of now, Clervie Ngounoue is not on the entry list; she is going to France to train next month and told me after the Junior Orange Bowl that she wasn't sure if she would be playing Les Petits As. 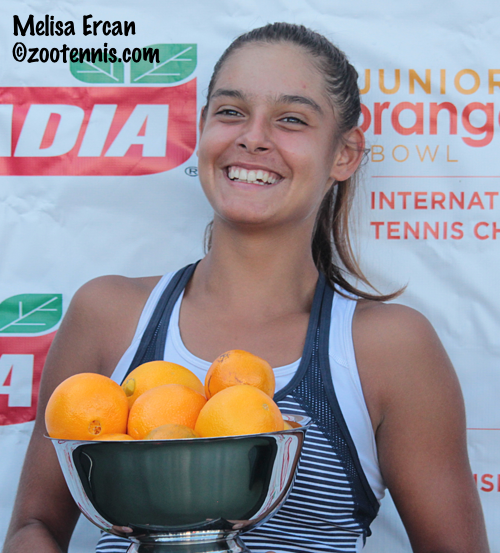 Junior Orange Bowl 14s champion Melisa Ercan of Turkey is currently listed in qualifying for some reason, which is not appropriate given her record this year in the 14s. The US girls in the draw are Kaitlyn Carnicella, Liv Hovde, Katherine Hui and Qavia Lopez, the latter replacing Meera Jesudason, who qualified in the October tournament in New Jersey organized by the Les Petits As tournament, but decided not to make the trip. The USTA is not sending a National Coach to Bolton and Tarbes, as it has always done in the past, so players and their families are on their own for this trip. The US boys on the entry list, determined at a similar qualifying tournament as the girls, are Cooper Williams, Learner Tien, Joseph Phillips and Kyle Kang. See the tournament website for more information on qualifiers from Asia and local pre-qualifying. The USTA's Men's and Women's National Open Championships concluded today at the Billie Jean King National Tennis Center in New York with titles for North Carolina junior Alexa Graham and Penn senior Kyle Mautner. Mautner, the No. 2 seed, did not have to hit a ball, with defending champion and top seed Blaine Boyden(North Carolina) withdrawing from the final with an injury. Graham, also seeded No. 2, defeated No. 4 seed Jessica Livianu, a junior at St. John's, 6-4, 6-2 for the women's title. She had lost in the final to Julia Elbaba(Virginia) last year. Livianu defeated top seed Elbaba in the semifinals this year 6-3, 7-5. Top seeds Christina Rosca, a Vanderbilt junior, and Marcela Cruz, a Vanderbilt recruit, won the women's doubles title, beating No. 2 seeds Anna Brylin, a Wake Forest freshman, and Anna Ulyashchenko, a Wake Forest senior, 6-4, 1-6, 7-5 in the final. Robert Kelly, a recent UNC grad and Boyden, a senior at UNC, won the doubles title, with the top seeds beating No. 5 seeds Ethan Nittolo(Buffalo) and Matt Kuhar(Bryant) 6-4, 7-6(3). The mixed doubles title went to the brother-sister pairing of Karl Poling, a Princeton freshman, and Lillian Poling, a Boise State junior, with the No. 2 seeds defeating top seeds Ulyashchenko and Justin Natale(Brown) 6-3, 3-6, 6-3 in the final. I have not been able to find a viable and long-term slideshow app or site that can host photos from the tournaments I cover, but the Tennis Recruiting Network has been able to host several galleries from this year on their site. Although I am not able to provide anything more than the player's name, when I previously would have shown their country and their position in the draw(semifinalist, champion etc. ), I do appreciate the opportunity to feature photos that I might not have room for in my daily coverage. 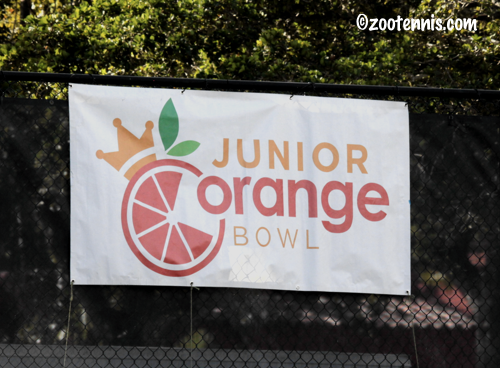 Today, TRN posted my Orange Bowl and Junior Orange Bowl galleries, with all the singles semifinalists featured in the former, and the top six finishers in the latter. Although qualifying in several WTA and ATP events has begun, the first play in the new ITF World Tennis Tour begins Monday, with a $25,000 men's event (M25) in Los Angeles its first tournament in the United States. 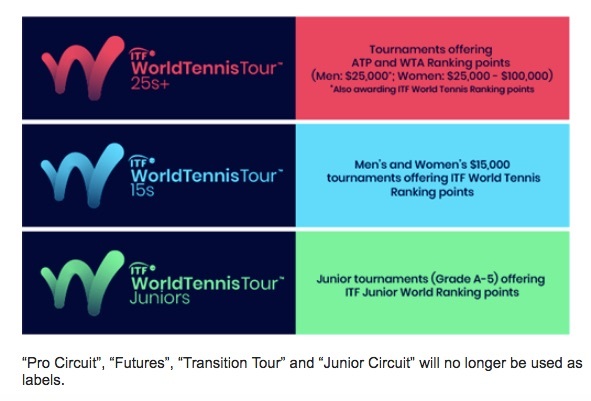 The USTA is no longer allowed to refer to its "Pro Circuit", for these events, which had also described those ATP Challengers sanctioned by the USTA, and the description of them as Futures is also gone. In the list of tournaments it has provided, the USTA now refers instead to its competitive pathway, with this the current list for men, and this the current list for women. This change has the advantage of including junior and collegiate events, which were previously not part of the Pro Circuit schedule. In addition to the M25 tournament in Los Angeles, where the qualifying draw of 24 begins Monday, the USTA's National Campus in Lake Nona is hosting an ATP Challenger, which also features new qualifying arrangements. Only four players are in qualifying, with two advancing to the main draw. The main draw has been expanded from 32 to 48, with the 16 seeds receiving first round byes. The tournament in Orlando, which was initially scheduled to be held in Waco Texas, has prize money of $54,160, and, as with all ATP Challengers in 2019, hospitality is included. Ohio State junior JJ Wolf received the wild card into qualifying, with Evan Song, Sam Riffice(Florida), Jared Hiltzik(Illinois), Michael Redlicki(Arkansas) and Alex Rybakov(TCU) receiving main draw wild cards. Rybakov earned his wild card by winning the Collegiate Wild Card Challenge earlier this month in Orlando. Both qualifying and first round matches will take place on Monday, with the schedule here. Darian King of Barbados is the No. 1 seed, with Mitch Krueger seeded No. 2. Other Americans are playing in the two additional ATP Challengers this week, both with prize money of $81,240. (I don't think these odd amounts are how the ATP wants the tournaments referenced and if I have this right, the Orlando Challenger is an ATP 80 and the other two are ATP 90s). In Noumea New Caledonia the Americans in the main draw are Noah Rubin, Donald Young, Roy Smith, Thai Kwiatkowski, and Christian Harrison. In Playford Australia, Tommy Paul and Ernesto Escobedo are in the main draw. ITF World Junior champion Chun Hsin Tseng of Taiwan qualified into the main draw, as did former Oklahoma star Andrew Harris of Australia. Tseng will face recent Illinois graduate Aleks Vukic of Australia, who received a wild card into the main draw. At the USTA 12s and 14s Winter National Championships in Tucson, a No. 2 seed and two of the No. 3 seeds were eliminated today. 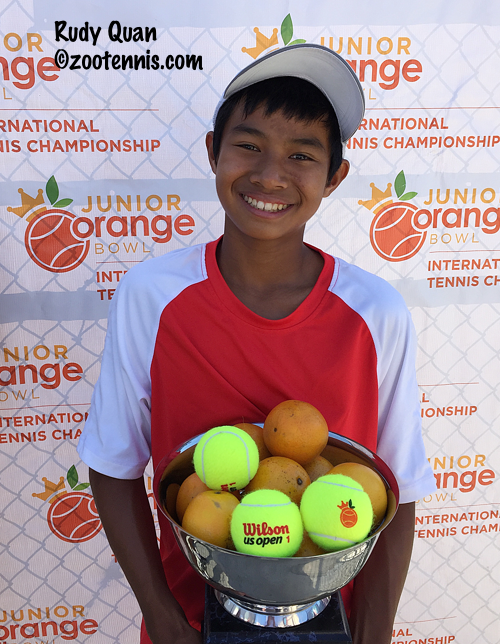 Junior Orange Bowl 12s champion Rudy Quan, playing the 14s this week in Tucson as a No. 17 seed, defeated No. 3 seed Lucas Brown 7-6(3), 4-6, 6-4 to reach the round of 16. The only other top 8 seed in the boys 14s to fall in the third round was No. 7 seed Ritesh Patel, who lost to No. 17 seed Brayden Michna 6-4, 6-4. In the girls 12s, No. 3 seed Thalia Smith was beaten by Sofya Vinogradova 6-3, 7-6(8). No. 6 seed Annika Renganathan lost to No. 17 seed Eva Oxford 7-6(4), 7-6(3) and No. 8 seed Bella Payne was beaten by unseeded Tianmei Wang 7-6(5), 6-4. In the girls 14s, No. 2 seed Aubrey Nisbet was defeated by unseeded Theodora Rabman 4-6, 6-3, 6-2, with No. 4 seed Salma Farhat also ousted today, losing to unseeded Larissa Teramura 6-3, 6-2. No. 7 seed Madison Weekley lost to unseeded Madeleine Jessup 7-5, 6-3 and with No. 8 seed Maeve Thornton losing in the first round and top seed Stephanie Yakoff withdrawing, only three Top 8 seeds remain in the girls 14s round of 16. All of the top 16 boys 12s seeds have advanced to the third round, which is still underway this evening. 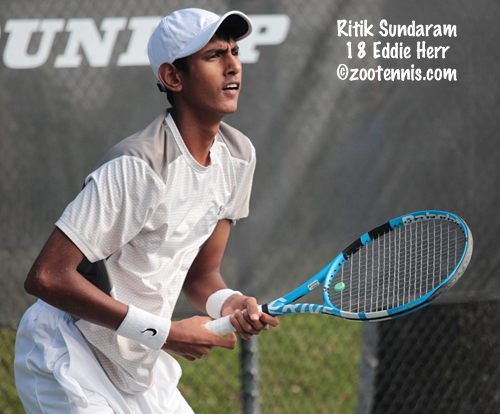 The first round of singles in the 16s and 18s Winter Nationals in Lake Nona Florida has concluded, with four Top 8 seeds eliminated in the 18s division. No. 3 seed Marcus McDaniel was beaten by Ritik Sundaram 4-6, 6-4, 6-2 and No. 6 seed Keshav Chopra fell to Saiprakash Goli 6-4, 6-3. The top 4 girls 18s seeds advanced, but No. 5 seed Karina Miller lost to Cassie McLay 2-6, 6-0, 6-3 and No. 6 seed Abigail Desiatnikov went out to Allie Gretkowski 5-7, 7-5, 7-6(6). The top 8 all came through in the boys 16s, but No. 5 seed Iris Gallo lost to Eileen Wang 7-5, 4-6, 6-4 in the first round of the girls 16s. Streaming is available at the USTA's National Campus page. While I was at the Orange Bowl early this month, I was fortunate to be able to talk with Kent Kinnear, who was named to lead men's tennis at the USTA back in October. Although Kinnear is obviously extremely busy with his new job, he was in Plantation for a few hours and we found time to discuss his first few weeks in his new position. 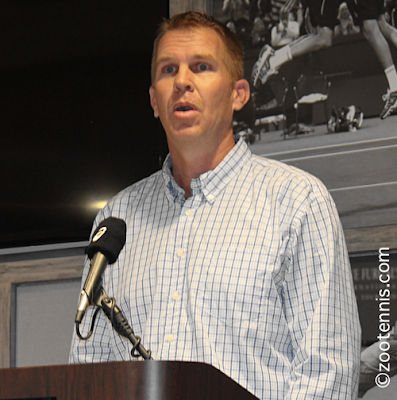 With his experience as a National Coach and, most recently, as Director of Player ID and Development, at the USTA, Kinnear will have fewer adjustments than an outside hire would, but he will certainly be dealing with unfamiliar issues and dynamics now that his realm includes professional tennis. I spoke with him about how his past experience could help, what he would like to change, and where he feels he needs to expand his knowledge. I was particularly interested to hear him note two areas of the USTA's player development culture that he would like to improve in this article for the Tennis Recruiting Network. US women went 1-7 in today's first round of qualifying at the WTA's premier event in Brisbane, with Christina McHale's 6-3, 6-0 win over top qualifying seed Aleksandra Krunic of Serbia the sole American victory. The US men are guaranteed to do at least as well, even though there are only four of them in the ATP 250 16-player qualifying in Brisbane, with top seed Bradley Klahn facing Chris Eubanks. Reilly Opelka and Bjorn Fratangelo are the other two US men in the Brisbane qualifying. There are no Americans in the qualifying at the WTA's Shenzhen event this week, nor at the ATP's 250s in Doha Qatar and Pune India. At the WTA International in Auckland New Zealand, Americans Sabrina Santamaria, Claire Liu, Jamie Loeb, Abigail Spears, Asia Muhammad and Danielle Lao are among 32 players hoping to win three matches to advance to the main draw. Rain disrupted the first day of play Thursday at the USTA 12s and 14s Winter Nationals in Tucson, with many of the second round of matches scheduled for today still in progress. The rain has apparently moved on, but it has left cold temperatures in its wake, with highs expected to be only in the low 50s for the next several days. A notable result posted today shows Girls 14s top seed Stephanie Yakoff withdrawing with an injury after winning her first round match. Boys 14s top seed Evan Wen and Girls 12s top seed Amber Yin have advanced to Saturday's third round. The 12s and 14s USTA Winter Nationals are underway in Tucson Arizona, while the draws have been released for the 16s and 18s divisions, which begin Saturday at the USTA National Campus in Lake Nona. Below are the top 16 seeds in each division. PlaySight streaming, which can be accessed here, is available on some courts. For complete draws, see the TennisLink site. The 2019 WTA season begins in just a few hours, when qualifying for the Premier level WTA tournament in Brisbane Australia starts. Eight American women are in the qualifying draw: Christina McHale, Jennifer Brady, Vania King, Varvara Lepchenko, Nicole Gibbs, Caroline Dolehide, Allie Kiick and Bernarda Pera. Several of the top teenagers are in the qualifying draw including Anastasia Potapova(RUS), who plays Gibbs, Olga Danilovic(SRB), Dayana Yastremska(UKR), who plays Lepchenko, and Marta Kostyuk(UKR). Another of the top teens, 17-year-old Amanda Anisimova, has received a wild card into the ASB Classic in Auckland, a WTA International level tournament this coming week in New Zealand. For more on Anisimova's wild card, see this article from the New Zealand Herald. The USTA Winter Nationals begin on Thursday for the 12s and 14s divisions, which are played in Tucson Arizona. First round matches in the 128 singles draw begin Thursday, after a round of doubles. Below are the top 16 singles seeds for each of the four divisions. For the draws, see the TennisLink site. The 16s and 18s divisions will begin on Saturday at the USTA's National Campus in Lake Nona Florida. 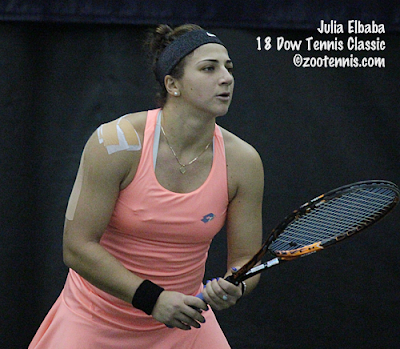 The USTA National Open Championships began today at the USTA's Billie Jean King National Tennis Center in New York, with defending champions Julia Elbaba and Blaine Boyden the No. 1 seeds. Boyden, who has already won his second round match after a bye in the first round of the 256-player draw, is a senior on the University of North Carolina's team. Elbaba, a former All-American at the University of Virginia, will play her first round match in the 64 draw on Thursday. 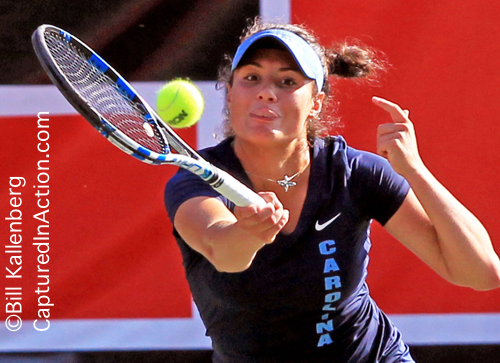 Alexa Graham, a junior at North Carolina and runner-up to Elbaba last year, is the No. 2 seed. The No. 2 seed in the men's draw is University of Pennsylvania senior Kyle Mautner, who lost to Boyden in last year's semifinals. Peter Bodo wrote a feature last week for ESPN.com on the two current ATP Top 10 players who played college tennis: South Africa's Kevin Anderson, No. 6, who played three years at Illinois, and John Isner, No. 10, who played four years at Georgia. Bodo notes the similarities--and the differences--between the two, and suggests they may be having their best results in their early 30s due to their college tennis experience. In just over a week, the first tournaments of the ITF World Tennis Tour will begin, and the apprehension accompanying it can be felt all over the community of competitive tennis. 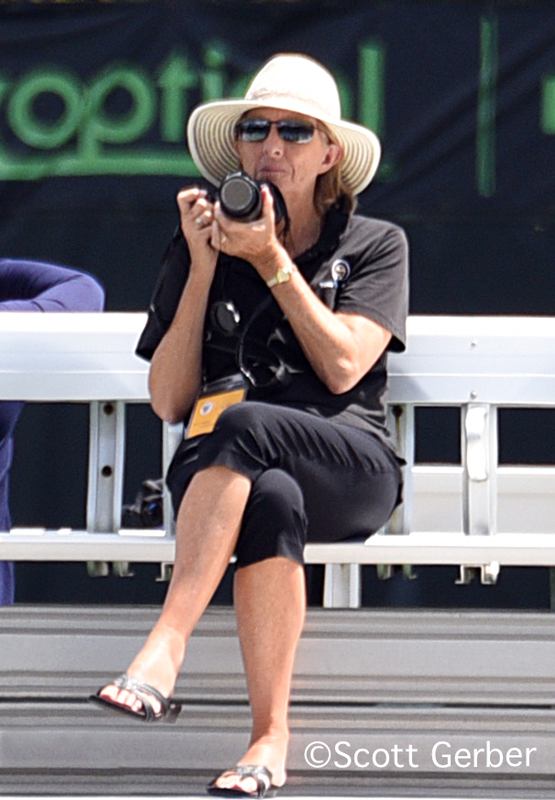 In Florida, I spoke to dozens of people about the changes that are coming as a result of the ITF's decision to narrow the pathway to the higher levels of pro tennis, and I will be featuring some of those conversations in an article I am planning for next month at the Tennis Recruiting Network. Geoff Grant, a member of the USTA's Junior Competition Committee and father of four competitive tennis players, including University of Florida recruit Will Grant, has been studying what the impact of the changes might be. I spoke to Grant before I left for Florida, so that I could ask questions with some knowledge of the possible downsides, not just for pro players, but for junior and college tennis in the United States. Grant was a guest on Tennis Channel/Sports Illustrated's Jon Wertheim's Beyond the Baseline podcast recently to discuss the implications of this drastic change, and in his opinion, they are not positive for tennis in general and college and USTA junior tennis in particular. The link to the podcast is here. For more on how the ITF World Tennis Tour will change tennis in the US, see this article from Parenting Aces. The acceptances for the ITF's World Tennis Tour Juniors Costa Rica J1 Coffee Bowl (it will take me some time to get accustomed to referring to the junior tournaments this way) are out, with 14 US boys and 19 US girls receiving entry into the main draw. The tournament, held from January 14-19 this year, always features a substantial number of Americans due to its location and its reputation for a pro tournament atmosphere. With the tournament the same time as the Grade 1 (I mean J1) warmup in Traralgon Australia, playing both Costa Rica and the Australian Open Junior Championships will not be possible this year. The US boys entered are: Eliot Spizzirri, Tyler Zink, Ronan Jachuck, Will Grant, Andres Martin, Alex Lee, Andrew Dale, Adam Neff, Dali Blanch, Alex Bernard, Hunter Heck, Keshav Chopra, Martin Damm and Alex Kiefer. The US girls entered are: Alexa Noel, Gabby Price, Savannah Broadus, Skyler Grishuk, Hina Inoue, Kailey Evans, Charlotte Owensby, Elvina Kalieva, Nikki Redelijk, Jenna DeFalco, Sanyukta Gawande, Tara Malik, Madison Sief, Charlotte Chavatipon. Ellie Coleman, Sofia Rojas, Julia Andreach, Elaine Chervinsky and Hibah Shaikh. The inaugural California Championships Presented by UTR concluded today, and after all the upsets and surprises, the player with the highest UTR, Sam Querrey, ended up with the title. Querrey(15.46) defeated University of Oregon senior Thomas Laurent of France(14.34) 6-3, 6-4 at the Jack Kramer Club in Rolling Hills Estates, California. Videos of matches from Thursday, Friday and today are available on Facebook, along with interviews of participants and others at the event. 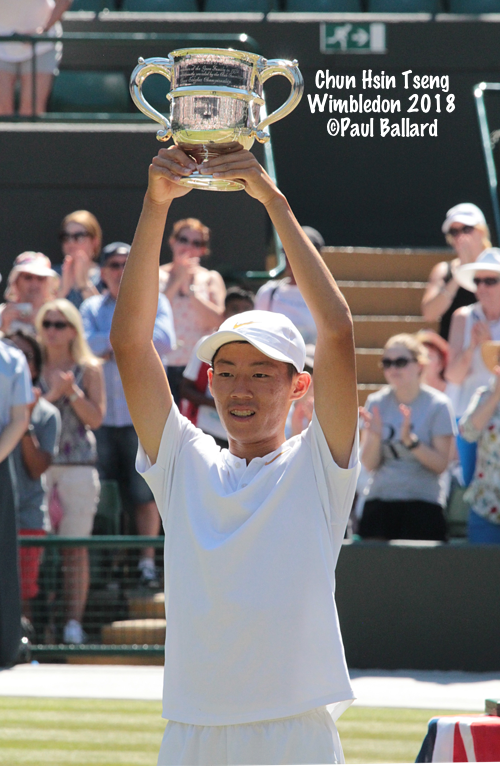 The New York Times recently published a feature on ITF World Junior champion Chun Hsin Tseng of Taiwan, which details the sacrifices his family has made to help him follow his dream of playing professional tennis. His mother works the family's business, a stall selling a vegetable snack in the night market in Taipei, while his father, who is also his coach, travels with him to tournaments around the world. Although he has another year of ITF junior tennis eligibility left, Tseng is leaving the circuit to concentrate on his ATP ranking, currently 441, with the hope of not only becoming self-sufficient, but relieving his ailing mother of the need to continue to work long hours. 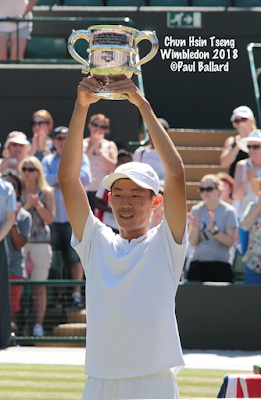 The article examines Tseng's prospects for success, including an interview with Patrick Mouratoglou, who has provided Tseng training at his academy in France since Tseng was 13. The WTA website has feature articles on the three youngest players in the Top 100: Amanda Anisimova of the US, Anastasia Potapova of Russia and Dayana Yastremska of Ukraine. Although 17-year-old Anisimova (US Open girls champion 2017) and 18-year-old Yastremska (Wimbledon girls finalist 2016) stopped playing junior tennis after those results, Potapova, 17, continued to play the ITF Junior Circuit after she won Wimbledon in 2016 in a successful bid for the ITF World Junior Championship. Reaching the Top 100 as a teenager is not easy, particularly with the WTA age restrictions, which will still affect Potapova until March, when she turns 18, and Anisimova until August, when she turns 18. Injuries could also flatten their trajectories of course, and Anisimova has already endured a significant one this spring and summer, but there's little doubt this trio, along with No. 108 Olga Danilovic of Serbia, also 17, will add energy and excitement to the WTA Tour in 2018. 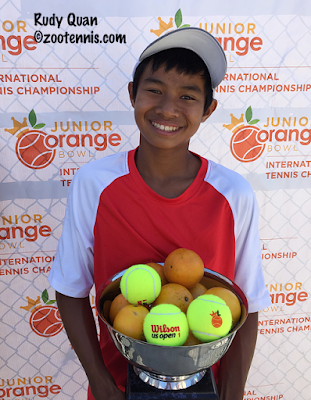 Americans had a good showing at the Junior Orange Bowl in Coral Gables Florida, with three of the four semifinalists in boys 12s and 14s, and two of the four semifinalists in girls 12s and 14s, with Clervie Ngounoue and Rudy Quan closing out phenomenal years with the 12s titles. The international players who come to Miami every December are a major part of the tournament's appeal and this year, the 14s champions were the first from their countries to earn Junior Orange Bowl titles. I wrapped up the tournament for the Tennis Recruiting Network in this article. 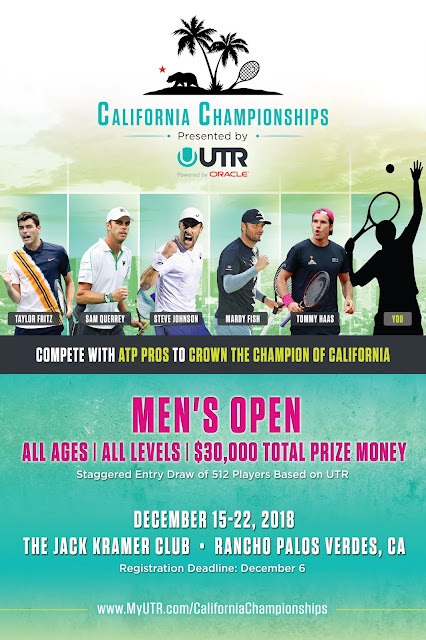 Saturday's semifinals at the UTR's California Open saw Sam Querrey and Thomas Laurent advance to Saturday's championship match, with Querrey beating Bradley Klan 7-5, 6-3 and Oregon senior Laurent avenging his dual match loss to USC's Brandon Holt back in March with a 6-1, 6-4 victory. Laurent, who turned 21 on Sunday, has a UTR of 14.34, while Querrey's UTR is 15.46. The match, scheduled for 1 p.m. Pacific time Saturday, will be streamed on Facebook. The Australian Open announced today that it would join the US Open and Wimbledon in ending final sets with tiebreakers. The US Open has long had a 12-point tiebreaker in final sets, while Wimbledon announced this fall that it will resort to one if a match reaches 12-12 in the final set. Australia has added a slight twist, with its tiebreaker the 18-point version, which is currently used in WTA, ATP and ITF doubles competition when the first two sets are split. The French Open will now be the only slam to continue with a two-game advantage needed in the final set. According to this BBC article, this change, which will be in effect in next month's tournament, will also be applied to the junior championships. In 2017, the juniors played advantage sets in the third in singles, but this year they played the 12-point tiebreaker at 6-6 in the third set. If the Australian Open junior doubles is played in this new format, it will constitute a big change, because in previous AO junior events, the no-ad, match- tiebreaker-in-lieu-of-a-third-set that is played in all ITF junior events was the format used. The inaugural California Open, a UTR sponsored tournament that has been going on since Saturday at the Jack Kramer Club in Rolling Hills Estates in Southern California, is now entering its final stages, with Thursday's quarterfinals producing some surprising results. The tournament, which allowed any player with a UTR ranking to make his way through qualifying to advance to round 1 of the main draw, which included former ATP pro Mardy Fish, current ATP pros Ernesto Escobedo, Dennis Novikov(UCLA), Gage Brymer(UCLA), Daniel Nguyen(USC), and current collegians Jacob Brumm(Cal), Brandon Holt(USC) and Thomas Laurent(Oregon). Awaiting the winners of those matches (Brymer, Novikov, Laurent and Holt) in the quarterfinals of the tournament, where higher UTR players are placed awaiting their opponents were ATP Top 100 pros Sam Querrey, Taylor Fritz, Bradley Klahn and Escobedo, who apparently got in as a lucky loser. Steve Johnson and Tommy Haas were scheduled to compete in the tournament, but withdrew in the past few days. Querrey defeated Brymer 6-3, 6-2, Klahn defeated Novikov 6-4, 6-2 and Laurent got his second win over Escobedo in two days, by a 6-0, 6-1 score. The biggest surprise was Holt's 6-4, 6-4 win over Fritz, who has a current ATP ranking of 49. Not only is Fritz's UTR nearly a full point higher than Holt's, the USC junior was playing in the USTA's Wild Card tournament final in Lake Nona on Tuesday before flying back home for his first round match Wednesday, then taking on Fritz today. Holt will face Laurent, whom he defeated in Pac-12 conference play back in March 6-1, 6-2, for a spot in the final, while Querrey and Klahn will meet in the other semifinal. The matches are being streamed on Facebook, with Tracy Austin and Stephen Amritraj providing commentary. The first semifinal between Holt and Laurent is scheduled for 11 a.m. Pacific, followed by Klahn and Querrey. For complete results, see the UTR event page. After three plus weeks covering the major junior events in Florida, I'm ready for a break, so posts over the next week will be brief. 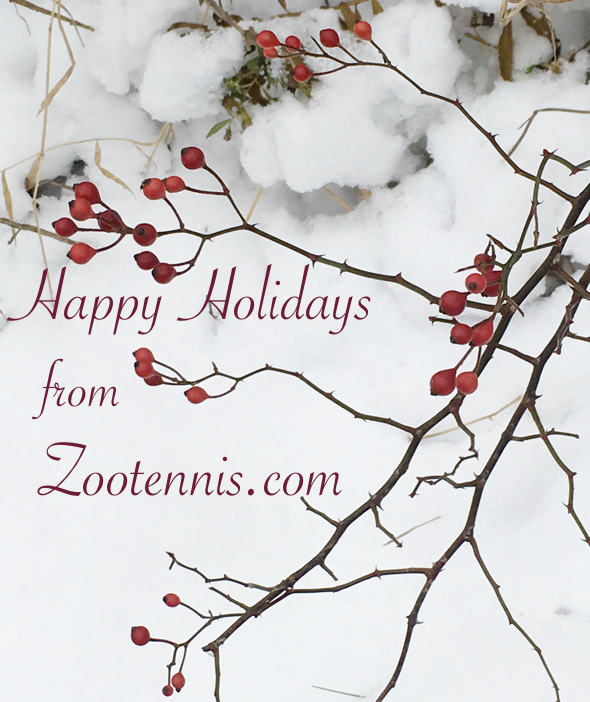 With no ITF junior events and no USTA Pro Circuit events, there's actually a bit of an "off-season" over the holidays, at least until the USTA Winter Nationals begin on December 27 (12s and 14s in Tucson) and December 29 (16s and 18s in Lake Nona). The USTA's National Campus has been a busy place recently, with the Wild Card Challenge for invited American collegians taking place there from December 15-18. 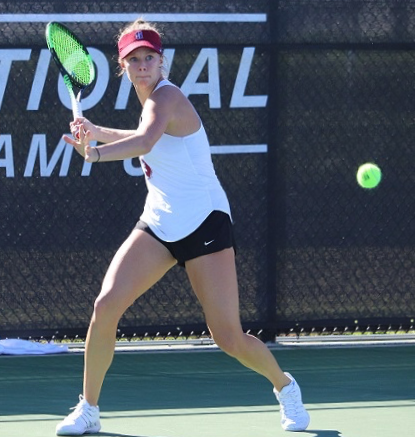 Stanford sophomore Michaela Gordon and TCU senior Alex Rybakov won the titles, with Gordon defeating Duke sophomore Kelly Chen 3-6, 6-4, 6-0 and Rybakov downing USC junior Brandon Holt 6-2, 6-1. Sam Riffice of Florida and Keegan Smith of UCLA were the other two men to advance to the semifinals via the round robin competition, with Pepperdine's Ashley Lahey and Gonzaga's Sophie Whittle the two women's semifinalists. The winners receive wild cards into Challenger-level events, with Rybakov now in the main draw of the Orlando Challenger which begins December 31st in Lake Nona. Gordon will receive a main draw wild card into a $60,000 women's Pro Circuit event in the future. Both have also received spots on the USTA's National Collegiate Team. The complete round robin results can be found here. The USTA announced today that it has entered into an agreement with the Tennis Channel to construct and operate a permanent production facility at the National Campus in Lake Nona. The complete release, below, mentions the rights to distribute a number of USTA events played in other locations, which I assume could include Kalamazoo, although I am just speculating. More information on the American Tennis Showcase mentioned below is here, although the weather Thursday may not cooperate, with rain in the forecast. ORLANDO, Fla., December 19, 2018 – The USTA and Tennis Channel today announced an agreement to partner on the construction and operation of a permanent broadcast facility at the USTA National Campus in order to produce live coverage of USTA professional, collegiate, adult and junior level events on a year-round basis. The agreement also grants Tennis Channel the rights to distribute a number of USTA events played in other locations. The relationship will help to elevate the profile of programming held at the USTA National Campus, giving visibility to the variety of events, initiatives, matches and competitions held throughout the year. In a similar fashion, this partnership will provide Tennis Channel with diverse and original live content for broadcast, with direct access and a behind-the-scenes look at news about both the community and professional sides of the game. The USTA National Campus serves as the national training center for elite American professional and junior players. As part of the partnership, which runs through 2022, Tennis Channel will air matches and additional programming from USTA Pro Circuit tournaments, College MatchDays and USTA League, Wheelchair and Junior National Championships on linear television, a number of which will take place at the USTA National Campus. The partnership officially begins this week with Tennis Channel’s live coverage of the USTA’s American Tennis Showcase Thursday, Dec. 20, at 6 p.m. ET, a celebration of the sport’s promising stars. Tennis Channel will bring the three-hour showcase to a nationwide audience with longtime network announcer Brett Haber, who will be joined by Hall of Famer Jim Courier and renowned sportscaster Mary Carillo. To assist in production, Tennis Channel is partnering with Full Sail University in Winter Park, Fla., to oversee a student-run production model in support of events and year-round reporting from the National Campus. A rotating group of students will work in a variety of areas, giving them a unique hands-on experience in event broadcasting and production. 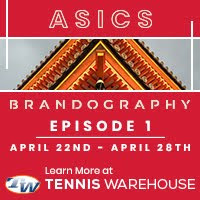 Earlier this year, Tennis Channel aired five College MatchDays between top NCAA Division I programs from the National Campus, the first live college tennis series in Tennis Channel’s history. In addition, multiple USTA Pro Circuit and Junior tennis matches were shown in 2018 on Tennis Channel. Additionally, Tennis Channel will have access to the USTA footage library, which includes archival US Open content, as well as select footage from US Open Series events. Turkey's Melisa Ercan and Hong Kong's Coleman Wong earned their countries' first Junior Orange Bowl titles in the 14s divisions Tuesday, while top seeded Americans Clervie Ngounoue and Rudy Quan earned the 12s titles as the 57th annual edition of the tournament concluded under clear blue skies at the University of Miami and Salvadore Park. Ercan earned a 6-3, 6-1 victory over unseeded 12-year-old Victoria Mboko of Canada, closing out her title with a seventh consecutive straight-sets victory. The fourth-seeded Ercan, who reached the semifinals of the Eddie Herr, was confident coming into the final, not only due to her recent success, but also due to her previous win over Mboko in the final of a U14 tournament in Germany this summer. "Before we play and I won, so I'm more focusing," said the 13-year-old, adding that previous win helped keep her nerves under control. "I'm believing in myself and I played my best I think today. She played so good too; it was very good match and I hope we will play a lot of finals." Mboko was not able to put any pressure on Ercan in the second set, and her string of three-setters ended at three as Ercan decisively closed the door. "I thought she played pretty good, but I don't think I played as well as I did the other days before," said Mboko. "I wasn't awake, I wasn't there, I don't know, I just wasn't feeling it today. I was a little bit nervous, because it was my first international final and I know she's really good." Ercan was smiling and taking photographs with the Turkish flag, enjoying the moment with her coaches from ProWorld Academy in Delray Beach, where she has been training prior to these big junior events in Florida. Ercan was well aware that she had an opportunity to become the first Orange Bowl winner from Turkey, and excited to have accomplished that. "I'm the first Turkish player," Ercan said. "It's an honor to be here, and I'm so happy. This is such a big tournament. It's very important for Turkey, first time Eddie Herr (Togan Tokac won the boys 14s), first time Orange Bowl. I think after this time, Turkey is so proud and I'm so proud for my country." Ercan will return to Turkey for the holidays and then prepare for Les Petits As. After defeating top seed and 2016 Junior Orange Bowl 12s champion Victor Lilov 7-6(3), 6-4, Wong donned a Nike Hong Kong T-shirt to celebrate his country's first Junior Orange Bowl title, which he said would be "really big" news in his home country. "It's unbelievable," said the 14-year-old, seeded No. 3. "I never think I can win this tournament. It's a 128 draw, it's really tough, every opponent is really good." Wong discovered that in his quarterfinal match against unseeded Sebastian Gornzy of the United States, who held a match point at 6-5 in the third set tiebreaker, only to see Wong win the next three points for a 4-6, 6-2, 7-6(6) victory. Against Lilov, Wong started out well, breaking Lilov to open the match and holding serve with little difficulty until faced with serving out the set at 5-4. Failing to get a single first serve in six attempts, Wong was broken when Lilov took advantage of the first break point he had seen in the match and then held for his first lead at 6-5. Wong saved four set points in the next game, then dominated the tiebreaker. "I don't want to take credit away, but we both played a very bad game, both of us, unforced error after unforced error," Lilov said of that 12th game. "I feel I should have won that game, but that's tennis, and then the tiebreaker he just played a better game than me. I missed too many returns." Lilov is not accustomed to being on defense, but Wong's huge forehand gave Lilov no opportunity to attack. "He was absolutely crushing the ball, hitting every ball really hard," said the 14-year-old Lilov, who trains with Kyle Spencer in Raleigh North Carolina. "Today was his day, I was too defensive to win, but that's just what happened." In the second set, Wong ran out to a 4-1 lead, but Lilov stayed in the match, and with Wong serving for the match at 5-3, broke him after saving four match points. One match point was won by Lilov, but the other three were lost on Wong's errors, which were coming with more frequency as the tension rose. "I was so nervous," said Wong. "I just don't know what to do there. I just want to serve in." Wong didn't hang his head after failing to convert those four match points and a devastating drop shop winner put him up 0-30 with Lilov serving at 4-5. Two points later he had the title. "I was so happy," said Wong. "I never thought I could win this, but at last, I won. I can't use words to describe the feeling." Wong is scheduled to compete in a Futures tournament next week in Hong Kong, before returning to ITF Junior Circuit events. Lilov is not sure what his schedule will be for the first few months of 2019. 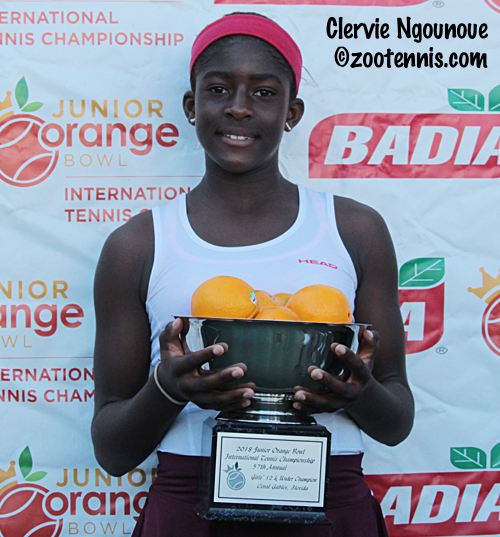 Clervie Ngounoue had already proven herself in the 14s division, winning the USTA Clay Court title and reaching the USTA Nationals and the Eddie Herr finals in that age group. Yet winning the Junior Orange Bowl 12s remained a goal, although she recognized that securing the title would be easier if she did not focus on it. "I tried not to put too much pressure on myself, I just went on the court with focus every single point," said the 12-year-old from Washington DC, who uses meditation and visualization in her pre-match routine. "So I came into the tournament with bigger plans, of course, but I took it as every other tournament." In the final against Brooklyn Olson, the No. 2 seed, Ngounoue said she kept her nerves under control and was able to play well from the beginning of her 6-3, 6-0 victory. "I knew what I had to do," said Ngounoue, who beat Olson in the Easter Bowl 12s semifinals back in March and went on to win that title. "I had to go on the court, put everything together and keep my focus." Ngounoue went up 5-1 but could not serve out the first set, with Olson finding ways to disrupt her rhythm and redirect some of Ngounoue's shots to unexpected places. But Ngounoue was able to break Olson to take the set, hitting a backhand winner on her second set point. The first game of the second set presented Olson with an opportunity to change the momentum, but she was unable to convert her break point opportunity. "That kind of threw me off," said Olson, who trains with Ashley Hobson at Inspiration Tennis Academy in Bradenton Florida. "I was like, Brooklyn, you had it, you had a few points and you could have got the game. I tried to focus on the next point, but she got it." Olson said she couldn't counteract Ngounoue's forehand. "She's improved tremendously," said Olson. "At Easter Bowl, her forehand wasn't as big, it was flat. Now she has spin. She would just move me out wide, I'd be in the alley and she would open up the court so well and then slap a winner. I was just wow, amazing shot." Once Olson was broken in the second game of the second set, the question was whether Ngounoue could keep her focus with the finish line in sight. She did. "I had the momentum, I knew that, and I just wanted to push it a little more," Ngounoue said. Ngounoue closed out the title to join her friend Coco Gauff on the list of girls 12s champions, with the recent ITF Orange Bowl champion attending the final. "Coco trains sometimes at the Mouratoglou Academy in Nice France, where I train as well," said Ngounoue, who also trains with her father Aime at Sport Fit Bowie in Maryland. "I saw her a few weeks ago, and before my match she said she would come watch me." After returning to Washington DC for the holidays, Ngounoue will be going to Mouratoglou for a training block. "I'm going to France in January, practice a little bit, and then I'll be back here in February," said Ngounoue, who is not sure if she will be playing the Les Petits As tournament at the end of January in Tarbes. Quan finished one of the best years in USTA junior tennis history with a 6-1, 6-4 victory over fellow American Santiago Muhala, a No. 9 seed, on the Har-Tru courts at Salvadore Park. 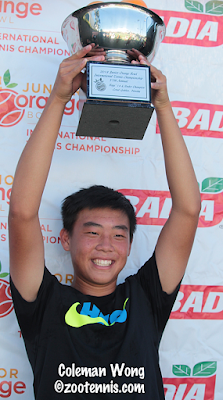 After winning the 12s division in the USTA Winter Nationals, Easter Bowl, Clay Courts and National Championships this year, Quan went into the Eddie Herr as the overwhelming favorite. But he suffered his only loss of the year in his age division in the semifinals to eventual champion Maximus Dussault. "I guess that was just a good learning experience for Orange Bowl, because I hadn't lost in a while," said the 12-year-old from Roseville California. Quan didn't lose a set throughout the tournament, with the most games he lost in any set coming in the second set against the powerful Muhala. "I was just trying to stay aggressive and hit every ball," Quan said. "Santiago played really well; he gave me a run for my money and I had to fight hard to win the match." Muhala said he was impressed with Quan's demeanor throughout the match. "Rudy is really mentally tough, to beat him is really tough," said the 12-year-old from Houston Texas. "He's a good kid, a good player. I think we both played really well, but in tennis, there's not a tie, so I think he took it today." Quan was especially pleased with his Junior Orange Bowl title, because he had not played an international event until Eddie Herr, and he was able to close out his career in the 12s division with one of the most prestigious titles in junior tennis. Muhala, who lost in the first round at the Junior Orange Bowl last year, put his run to the final in perspective. "First of all it's amazing just to participate in the Orange Bowl," Muhala said. "Getting to the finals is amazing, something anyone would want to do, and it was just great, coming here and playing people from around the world." Third place: Alexis Blokhina(USA) def. Violeta Martinez(USA) 3-6, 2-1 ret. injury.